+ 15% off your purchase with promocode "ihearthandmade"
Sher - all the many decisions that constantly need to be made and you have to make them. Sam – how you really need to plan in advance, it takes allot of forethought. Holidays are always popping up and you need to be ready weeks before that day which means ordering weeks before that! 4. Some say that the best business partners complement each other's strengths and weaknesses. Can you illustrate this balance using 3 points. >> So you think your goods are perfect for Truly? 5. Do most of the other designers you carry approach you, or do you actively seek out new designers/crafters? If so, where? We actively seek out new vendors and we also get allot of seekers. we look everywhere and anywhere. 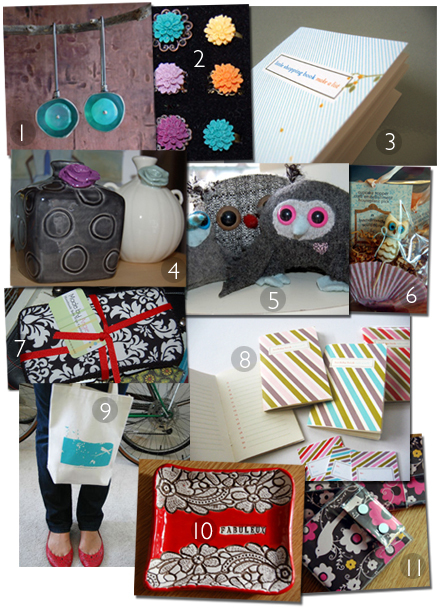 Online, on our travels, indie craft shows, some blogs are a great resource. 8. You've been in business since 2006 - was there a year where you felt some kind of sigh of relief and felt confident that you weren't going to be part of a statistic? They say that in the restaurant business, you shouldn't expect to see any profit until your second year - is it the same for retail in your experience? What should aspiring store owners be prepared to expect? No sigh of relief here… not yet, we started to feel the recession last December. but good news this December we were up! 9. How did you figure out how much inventory to buy for the very first time? What method did you use in figuring out your initial product mix/depth? It was a difficult thing to figure out but you come as close as you can and just go for it. what we did was cut out pictures of the items and tacked them up on a board to see if we were too heavy in one area and to see our product mix together. We would pay down our loan and hire a visual marketing person to help with the outside, hallway and windows. we would also host a big party for our customers with free cupcakes, champagne and big discounts! 15% off your purchase with promocode "ihearthandmade"
What a great little shop and I shall add it to my list of wonderful shops you have profiled here hun! I appreciate their honesty and dedication. Six months to open a shop sounds like a long time but it really isn't. Well done, ladies! Nice interview/profile; I enjoy these on your blog...thanks! This is a lovely shop! I am so happy they are in the Twin Cities area, where I am! I have been in Truly and it truly is an awesome array of local and national talent. However, I have found the owners, especially the blonde one to be quite snooty. I think if they became more "people-oriented", their shop would just explode with potential.